Fingernails play an important role on the first impression you make on others. Unhealthy or ill-maintained nails speak volumes even before you open your mouth. Fortunately, caring for your nails isn’t that difficult. All you need is some knowledge on how to care for your nails, as well as an idea on what nail sins to avoid to achieve beautiful and healthy nails. Sawing your nails back and forth weakens the edge of your nail and worsens nail peeling. So instead of filing your nails in opposite directions, file it in one direction only. It’ll take time, but your nails will be stronger in return. While you’re at it, toss your metal nail file away, and opt for a flexible emery board or a glass file. Another nail care sin to avoid is peeling off your gel manicure. Gel polish adheres well to the natural nail that peeling it off almost always strips off a layer of your nail. This leaves your nail weaker, thinner, and nearly ruined. Instead of peeling your gel manicure on your own, visit a salon in your area in Singapore to have the gel polish properly removed. Cuticles work by protecting the base of our nail from bacteria, and removing these cuticles puts us at risk for developing nail infection. To properly groom your cuticles, use an orange stick to clean them up, and keep them moisturized. Most conventional cleaning products contain harsh disinfecting chemicals like bleach and alcohol. While these chemicals are needed to clean your toilet bowl, don’t let them get near your hands as they will dry out your nails and ruin your polish. To keep your nails protected, make it a habit to wear gloves even when you’re using gentler cleaning products. Like peeling your gel manicure, picking at your nail polish can also be damaging to your nails. Not only does picking at your nail polish make it look unsightly, it’ll also tear off some parts of your nail leaving you with damaged and uneven surface. Most of us probably experienced feeling frustrated over having pink-stained nails after removing a dark red nail polish. If so, then you probably neglected applying some base coat under your nail polish. To avoid experiencing this problem, always wear a base coat when you’re wearing dark shades of nail polish. 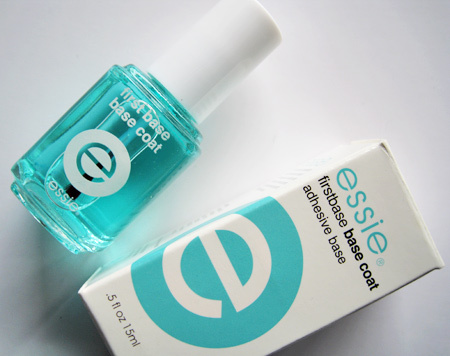 Taking care of your nails isn’t that difficult – it’s fun, even. Just make sure that you keep the aforementioned nail care sins in mind to get the healthy and beautiful nails you’ve always wanted. Silk Pillowcase: The New ‘It’ Beauty Tool? Beauty sleep is not just a myth. The number of hours we spend sleeping will determine if we’ll look well-rested the next day or extremely haggard. Sleep has been known as an important factor in our physical and internal health, probably since the early days. But do you know that the conditions of the bed we sleep in is as important as this? The most common pillowcase most of us use is the cotton pillowcase. Aside from being available anywhere, it is also inexpensive. There are a lot of online articles and studies stating that using a silk pillowcase is the better option than the standard cotton. Beauty enthusiasts are raving about silk pillowcases being the new must-have beauty tool. These claims are even backed up by scientific studies that prove the benefits of silk pillowcases. Let’s tackle each one of them and together discover all the good effects of regularly using silk pillowcases when sleeping. University of Bologna researchers delved into the topic of silk pillowcases and its relationship with dermatitis, a chronic skin inflammation. The study shows that standard cotton pillowcases was a form of irritant for people suffering from this disease because of its short and sharp fibers, and the way it moves across the skin. Silk has smoother fabric fibers so there’s lesser friction that produces a calming effect for any skin condition. Using silk as a pillowcase minimizes the amount of abrasion the skin gets when we sleep. Silk also does not absorb the moisture of the skin-a better environment when using night creams and moisturizers before bedtime. The position in which we place our face on our pillow when sleeping can affect the amount of wrinkles we get as we sleep. Normal cotton pillowcases are harsher and can cause a pull on the skin, even on the more delicate eye area. Silk pillowcases promote anti-aging because it aids in preventing the formation of wrinkles during nighttime. 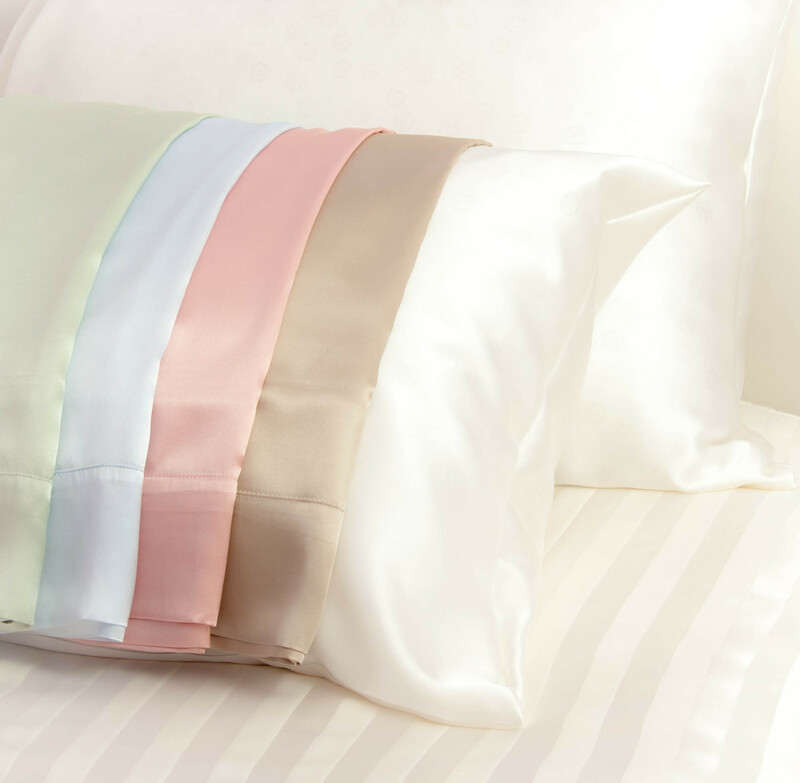 When we use silk pillowcases, we say goodbye to annoying creases we get as we sleep. Silk fabrics contain essential amino acids and natural protein that help counter ageing and calm the nervous system. Does wonders for the hair, too! Since there is significantly lesser friction when sleeping on silk pillowcases, there is also relatively lesser amount of breakage and thinning in our hair. Our hair glides through silk so breakage can be avoided and lessened. Silk pillowcases also help in retaining the moisture of the hair- giving it shin and vitality. Furthermore, silk pillowcases make the hair less greasy in the morning because it diminishes the production of sebum in our hair follicles. For people with hypersensitive skin, the answer to your skin troubles can be as simple as changing your normal pillowcase to silk ones. 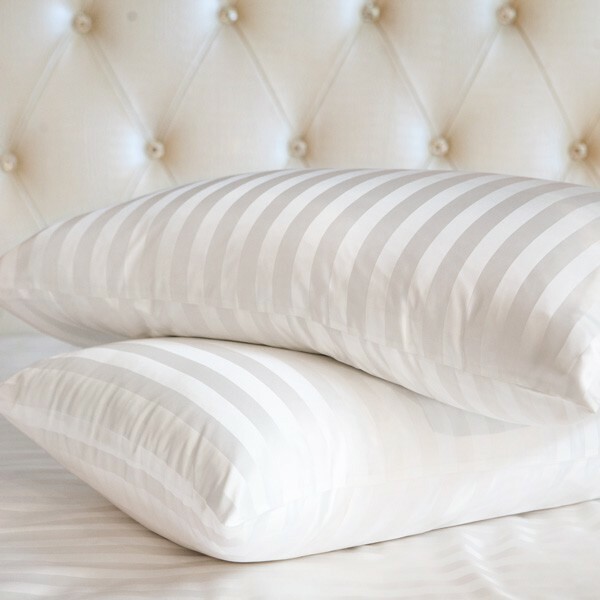 Since they are hypoallergenic, a silk pillowcase is naturally resistant to fungus, dust mites and molds. This factor is essential for people sensitive to allergens in order for them to enjoy a good night’s sleep. Another important tip is to guarantee proper washing of silk pillowcases- must be machine –washed in a cool setting using hypoallergenic detergent powder. Ageing is an inevitable process every living being must go through. Skin that used to be plump and soft will eventually develop lines and wrinkles. What used to be smooth and supple skin can turn rough and sagging. However, there is evidence provided by science that tells us that how we age can be a result of our lifestyle choices. If we take into great detail what food we put in our body, coupled with enough sleep and regular exercise, the idea of preserving young-looking skin is not a dubious one. Foods rich in antioxidants and alkaline can counter the effects of oxidative stress in the body. Oxidative stress is said to be the leading cause of physical aging- affecting everything from vitality to wrinkle formation. Here are the anti-aging foods that help you keep that youthful skin. Cruciferous greens. Vegetables that are part of this group are kale, cauliflower, broccoli, cabbage and Brussels sprouts. Cruciferous greens are heavily packed with antioxidants and fiber that not only fights cancer, but also prevent cell damage and reduce free radicals in the body. Fatty fish. Fatty fish are great sources of lean protein and omega-3 fatty acids. Fish rich in oil such as Atlantic mackerel and salmon keep the skin young and supple. It also does wonders for your hair. When choosing fatty fish, steer clear of those high in mercury content. Coconut oil. Not only is coconut oil good to put on your skin, it is also beneficial to put in your body. 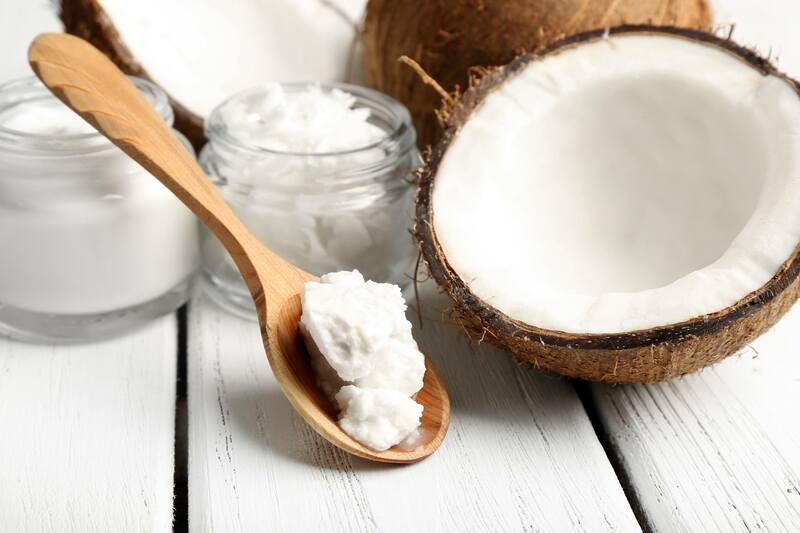 Coconut oil, a rich source of healthy fat, is a secret to anti-aging and effective shedding of unwanted weight. You can even use it as a natural sunscreen! Avocado. This fruit is a good source of nutrients that our body cannot produce on its own. It naturally lowers cholesterol levels and reverse the physical signs of aging. Our skin needs good fats in order to retain its natural elasticity. Raw cacao. Surely a lot of us are celebrating right now, our favorite comfort food has ant-aging powers. A revered superfood, cacao beans are rich in essentials minerals and vitamins, from zinc and magnesium to vitamin B that makes us feel good and look good. Spirulina. Spirulina is a dietary supplement that is an extremely rich source of antioxidants that combat oxidative stress in the body. It contains 25 times more beta-carotene than those found in carrots. It optimizes organ health and provide the overall appearance of youthfulness. Goji berries. People who are advocates of healthy eating for great skin are no stranger to goji berries. Said to have been discovered first by monks in Tibet, these berries purify the blood and boost energy. Potent nutrients that naturally rejuvenate the skin are present in this delicious berry. Hemp seeds. 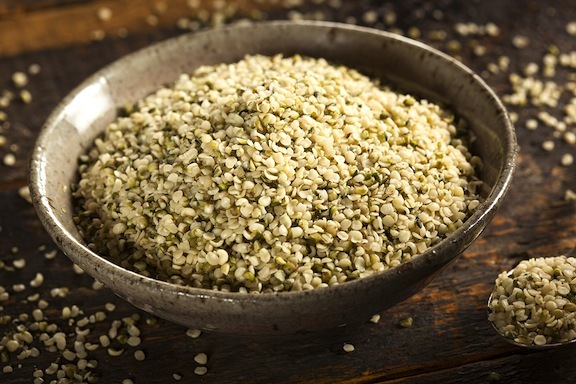 Hemp seeds are the only known edible source of gamma-linoleic-acid, an omega-6 fat that combats inflammation. Hemp is a wonderful food source that boosts the firmness and maintain the healthy glow of the skin. When incorporated in a plant-based diet, hemp is perfect in boosting the skin’s elastin and collagen.